With John Lasseter taking over Walt Disney Animation Studios a few years ago this little trait has entered the Mouse's films as well. 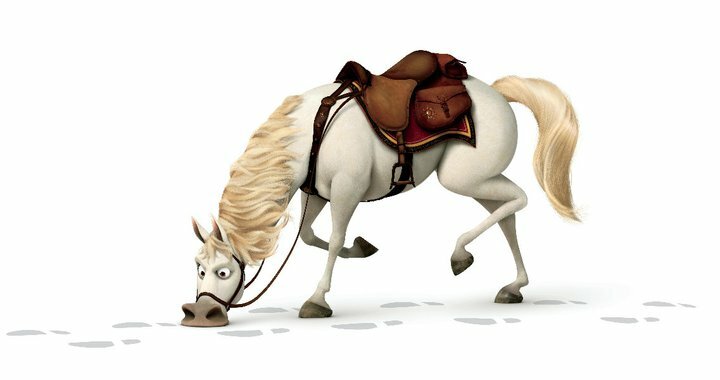 While in "Bolt" it was Rhino and in "TP&TF" it was Louis, in "Tangled" there are a couple of interesting characters that stand out like the chameleon, Pascal, but it's Maximus the horse that steals the show. Both in terms of character and animation, he's absolutely hysterical and totally genuine. The trusty horse never says a word, but like Pluto with his pantomime many years before him, there is no mistaking what his intent is. No voice is needed to make this wonderful Disney character seem so fully dimensional and 3D, even without the glasses. Like the article I posted years ago about the Lamp's sidekick, Maximus will join a great list of entertaining cast members that go down as beloved creations for families to talk about. Not to mention buy all those nice merchandise that Disney will want to make based on him. Wouldn't it be nice to see a Disney Short staring him on the DVD release? Hmmm. what? you're saying Disney didn't have great secondary characters before John? Have you ever watched a Disney movie? That guy did look funny from what I saw of him in trailers. There was one point in the trailer I saw before TS3, which made me laugh hard. It hurt me deeply when I found out there was no Louis the Aligator or (perhaps more unlikely) Ray the Firefly short with TP&TF. I hope this is corrected by the Tangled DVD\BluRay release, with the addition of a new Tangled spin-off short. I agree with Anonymous. Examples: Before John came to Disney with "Bolt," there was Chicken Little. Runt of the Litter and Fish Out Of Water stole the show. And in Meet the Robinsons... well, a lot of secondary things stole the show, like the frogs. And the dino. Please let us not forget a more recent wordless horse by the name of Bullseye. As far as I can remember Pascal the Chameleon is the only Disney character who intentionally murders the villain. Just saying. Prince Philip and the Faeries intentionally murder Maleficent. Mulan and co. intentionally murder Shan Yu. Hercules intentionally consigns Hades to a fate probably worse than death. There's no telling what the Dwarfs would have done to the Old Hag if nature hadn't intervened. You are a giant tool aren't you Honor? Disney basically utilized the use of secondary characters like nobody else. PIXAR and Lasseter were inspired by Walt, don't forget that. Lasseter did not do sidekicks better than the Disney guys in the early nineties. Iago is still awesome and everyone in Beauty and the Beast adds something to the film. Fool.